This book will aid the electrician when the electrical inspector cites a violation. The electrical inspector should always give the reference section, preferably in writing, for any correction they request. If the inspector cannot cite the reference section of the Code, they should not cite the installation. 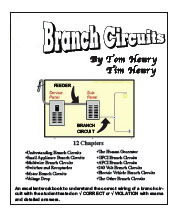 An excellent workbook to understand the correct wiring of a branch circuit with the student tested on, is it a correct installation or a violation of the Code along with exams and detailed answers. This book was written for the electrician wiring a residence following the minimum safety standards of the National Electrical Code. The exams are written the way the license exam should be written requesting the Code section to be written prior to selecting a choice of answers. The Code should always be referenced directly to make sure. When the Code is referenced, it is a good idea to record the section number in the Code book. This is referred to as "citing the Code reference." By citing the Code section, it will eliminate guessing at the multiple choice of answers the day of the exam. Example: A 20 amp rated branch circuit may be loaded to a maximum of ___ amps. This workbook is based on the 2017 National Electrical Code.